A quick post on a recent paper from one of the authors, Andrew Weatherall. You can get the full text over here and it might be worth having a quick look at a quick review of a study from the Netherlands that Alan Garner did previously. Every summer, for too many summers, prehospital teams at CareFlight go to drownings. Too many drownings. This isn’t to say it’s only summer, but that is definitely when most of the work happens. Sometimes they’re clustered in a way that makes you think there’s some malevolent purpose to it, some malign manipulation of chance striking at families. And also at our teams, particularly the paramedics, backing up day after day. So drowning is something we want to understand better. What are we offering? What are our longer term outcomes? And surprisingly given that drowning has been a long-term feature of preventable tragedy, particularly in Australia, there’s not really that much research out there. In fact it was only in 2002 that clever people at the World Congress on Drowning sat down and agreed on definitions for what was really drowning. So we set about trying to add at least a little bit to the discussion. Retrospective research has a bunch of issues. It has a place though when you’re trying to understand your current practice and what you’re actually seeing, rather than just what you think you’re seeing. We went back and looked at a 5 year period between April 2007 and 2012 (and full credit to co-author Claire Barker who did the majority of that grunt work). For most of this time the tasking system included the HEMS crew observing the computer assisted dispatch system screens. For some of the time there was also a central control person doing this while from March 2011 on there was only the central control person. The aim of the game was to pick up cases where there was an immersion mechanism and either reduced conscious state or CPR and get a team with advanced medical skills moving. Key points of interest were whether the cases were picked up, what interventions the HEMS team undertook and, if possible, what were the outcomes for those patients? In particular was it possible to glean what their longer term outcomes were? 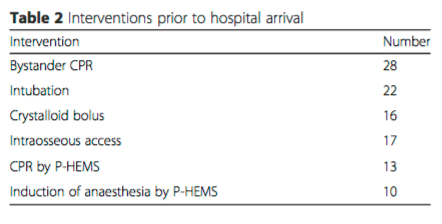 Up until the move to solely central tasking, all of those at the severe end of the scale (ISS > 15 meaning they had an altered level of consciousness of documented cardiac arrest) were identified for a HEMS team response. Once it went to central control alone, 3 of the relevant 7 were not identified (obviously not super big numbers). So what were our other findings? This group did not do well. Of the 14 in this group, 10 died within 2 weeks. Of the other 4, one died at 17 months, having had significant neurological impairment after their drowning. But there was one patient with GCS 3 and a first reported rhythm of asystole that was rated as having normal neurological development on follow-up by the hospital system. What was different about this kid? How do we make that outlier fit right in the middle? That’s a nagging question from this study. In our patients, if you had an initial GCS over 8 there was no evidence of new neurological deficit. All the patients with GCS 8 or below were intubated and ventilated by the teams. Every patient with a GCS over 3 when the team arrived survived. All of the survivors (with any initial GCS) had return of spontaneous circulation by the time they were in ED. An observation along the way that is a real highlight. All but one child with a GCS less than 8 on arrival of the HEMS team had received bystander CPR (and that included all of them for those who were systolic). Here’s hoping that marks good community knowledge of what has to be done. There are the usual issues with retrospective studies here. Some patient may have moved out of area and not had subsequent follow-up. 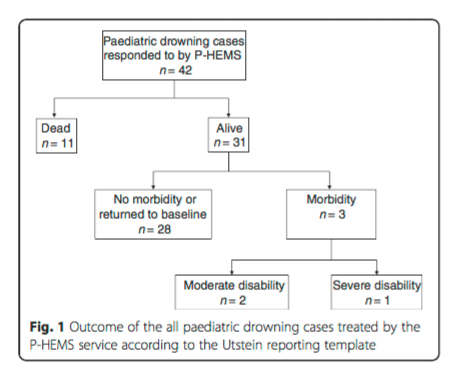 There’s also those three cases of severe drowning not picked up after the change in tasking options after March 2011. As those patients weren’t managed by the reporting HEMS team they don’t make up part of the 42 in this data set. As mentioned in the results, two of those cases went to adult trauma centres first, then were transferred more than 4 hours after the incident to a paeds specialist centre, where they unfortunately passed away. The other case did get a HEMS response by another organisation but we didn’t have detailed access to the treatments undertaken. Another really important point about the follow-up. The follow-up here is short-term, as it was what is available from the hospitals. It may well be that more subtle neurological impairment only becomes evident as kids get older, particularly when they hit school age. I happen to know that The Children’s Hospital at Westmead has done some work on longer term neurological outcomes which should hopefully hit the public airwaves soon. Intriguingly they’ve looked at kids thought to be entirely neurologically normal and followed them in detail over the longer term. No spoilers in this post but I’ll definitely follow up when it breaks. It’s also the case that when you’re looking at those who get a HEMS response, you’re not catching the denominator of all drownings. This study doesn’t help us understand what proportion of total drownings end up at this more severe end of the spectrum. With those provisos, retrospective research still has a key role. It’s still a brick of knowledge. A small brick maybe, but a brick. It’s certainly a better brick to build with than you end up with if you don’t look. More. Always more data. There is a bit here that suggests things similar to other series, some of which are a good deal bigger. Outcomes after arrest from drowning are better than is generally the case. Our impression is that, as suggested by that Netherlands paper, time does matter and that once you get beyond 30 minutes of resuscitation further efforts are unlikely to help. The other factor that would appear to make sense (but clearly needs lots of robust research) is that earlier delivery of interventions that should make a difference to outcomes would be good. That surely starts with a big focus on bystander CPR. But that should also be backed up by accurate, early triage of teams with the skills to extend that care. The right teams in the right place at the right time remains the challenge. There’s a comprehensive bit on the tasking stuff in this earlier paper relating to tasking and paeds trauma. It should clarify the different systems used, which can be a bit hard to get your head around. Start of emergency call to team on scene = 17 minutes. Time on the scene = 17 minutes. Total prehospital time = 54 minutes.